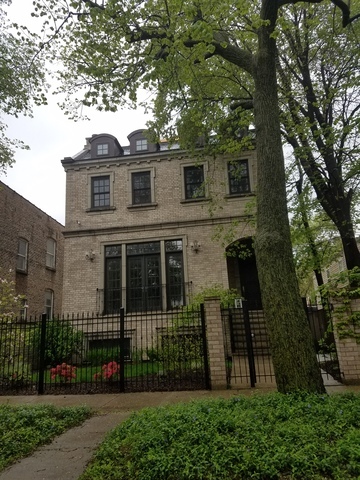 Stunning renovation on one of most sought after blocks in bucktown designed by award winning architect paul florian w/mondrian style all-glass rear which provides unparalleled natural light & overlooks the abundant outdoor spaces by chicago green design. Main level features 5" light oak flooring, captivating center staircase, sleek kitchen w/waterfall quartz counters, bright great room w/custom built-ins, leading to large ipe deck w/built-in grill, irrigated landscaping & yard w/synthetic turf. Innovative layout includes coveted mudroom side entry, master suite w/walkthrough dual closets, marble master bath w/kallista fixtures & heated floors, jack & jill bath for 2nd/3rd bedrooms & laundry room on bedroom level. Top floor w/full bath currently office could be 5th bedroom. Impressive roof deck w/bar, sunshades & putting green. Large storage area which could be exercise room. Elan smart home w/surround sound. Sport court over garage. Walk to the heart of bucktown, the 606 & blue line. Meticulous renovation w/ attention paid to every detail! Light filled home with amazing floorplan--5 bed/3.5 bath w/ bonus 3rd floor & 5 outdoor spaces. includes custom white kitchen w/ wood cabinetry & high-end SS appliances--wolf range/oven, dishwasher & fridge. Butlers pantry w/ wine fridge. Kitchen opens to family room w/ floor to ceiling windows. Brand new baths all with custom vanities, beautiful tile work & toilets. Spacious master suite w/ vaulted ceilings, walk-in closet & gorgeous renovated bath--custom clawfoot tub, steam/rain shower, double vanity w/ custom lighting & heated floors. Two additional bedrooms on 2nd level & a bonus office on the top floor leading to deck. LL w/ 2 bedrooms, bath, rec room, 2nd laundry room & custom mudroom. Smart Control 4 home w/lighting, music, cameras & temperature. Private rooftop above large 2+ car garage complete this amazing Bucktown home just steps to the 606, the Blue Line & so much more! Contemporary extra-wide home with a 2.5 car garage on a 30' wide lot on one of the best blocks in Bucktown just steps from the 606. Features of the bright main level include hardwood floor thru-out, 10'8" ceiling, woodburning fireplace with gas starter, large chef's kitchen with breakfast bar that opens to a family room and a few steps down to a patio that is ideal for entertaining. Second level has 4 bedrooms all on one level. Spacious master bedroom suite has an updated bath with double-sinks, whirlpool and separate shower, huge walk-in closet and a balcony. Lower level has a recreational room, laundry room, bedroom with an adjoining sitting room that could be combined to make a large bedroom. There are interior stairs to the roof which could be a fabulous roofdeck. Fabulous location close to shopping, restaurants, the 606 and the Blue Line.